What Do Manufacturers Want from the Cloud? Integration with other systems and applications. 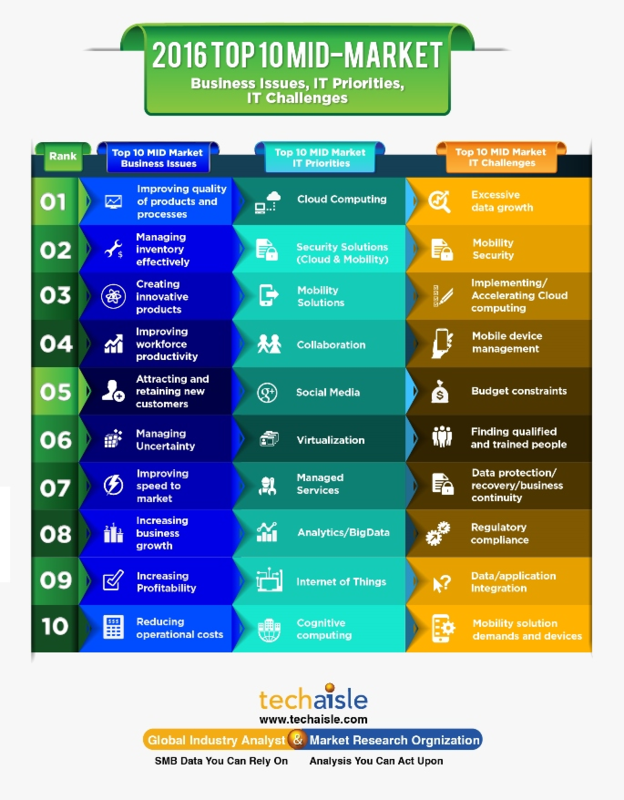 Techaisle, a global SMB IT Market Research and Industry Analyst firm, conducted a survey1 in which it investigated 14 different technology areas and more sub-technology areas, 19 different IT challenges and 19 different business issues for small-market and mid-market businesses. According to Techaisle, cloud computing, social media, mobility and collaboration are the four highest priorities for small businesses in 2016. The same survey also found that SMBs listed improving the quality of products and processes, increasing productivity, attracting and retaining new customers, and increasing profitability as their top business issues. The results of the survey for small businesses are shown below. When we look at Techaisle’s survey results for mid-market firms, we see many of the same priorities and business issues reported by small businesses. Cloud computing, mobility and collaboration are included in the top four priorities for these firms, joined by Security Solutions for cloud and mobility. Mid-market firms reported that their top business issues are improving the quality of products and processes, managing inventory effectively, creating innovative products, and improving workforce productivity. The results of Techaisle’s mid-market survey are shown below. The Techaisle study echoes the findings in the Harvey Nash/KPMG Global CIO Survey of 20162. The survey of global IT leaders showed that many firms no longer consider cost savings as the primary reason for moving to the cloud. Four out of ten respondents use cloud technology to increase business agility and responsiveness, the same number use the cloud to improve availability and resiliency, and more than a third use it to accelerate product innovation. These three things were all more important than cost. The survey also found two thirds of CIOs reporting that moving systems to the cloud in the past two years has been successful. While there are many so-called cloud ERP solutions on the market these days, most of them fall short of meeting manufacturing firms’ requirements. However, manufacturers can now implement an end-to-end true cloud ERP solution thanks to Rootstock Software and the Salesforce Cloud Platform. This true cloud ERP solution comprises an ecosystem of products, including Salesforce CRM (Sales Cloud) and Salesforce Service Cloud, Rootstock ERP and other partner solutions that, when seamlessly integrated, extend a manufacturing ERP system to support many business processes. Salesforce, when partnered with Rootstock Cloud ERP and other applications not only can provide manufacturers with a complete ERP, but also extends the Rootstock Cloud ERP backbone with the other business applications that are on the Salesforce Cloud Platform. This true cloud ERP solution demonstrates how a company can automate their back office and make it more accessible, proving the power and capabilities of the Salesforce ecosystem when combined with Rootstock ERP for manufacturers. Such a solution provides end-to-end flow in real time without the need to build integration between products. It’s easy to see why Salesforce’s cloud platform is ideal for manufacturers. Firms looking for a manufacturing ERP solution on Salesforce can look to Rootstock Software, a 100% native, full-scale ERP suite on Salesforce’s Force.com platform. Rootstock enterprise apps share data and integrate seamlessly out of the box with other native apps like Salesforce.com and other financial software, providing a complete enterprise cloud-computing solution. Rootstock’s ERP software makes it possible for companies to manage manufacturing, distribution and supply chain operations anywhere and in real time. Compared to other cloud platforms available, such as Amazon, Microsoft, Google and Netsuite, Salesforce has the largest ecosystem of integrated apps and app developers. Rootstock on Salesforce lets manufacturers and distributors access a single system to coordinate multiple sites and services with centralized visibility across global operations. Organizations can achieve greater insight into each step of the manufacturing, distribution and supply chain processes. Rootstock lets firms seamlessly manage sales orders by converting customer quotes into product orders, and generate orders for suppliers using purchase order management modules. There are cloud ERP modules for production engineering, inventory management, lot and serial control, scheduling and capacity planning, and shop floor control. Material requirements planning (MRP) helps companies plan what to buy/make in time to build products. Manufacturing cost control and project control modules give companies finer control over costs. The combination of the power of Salesforce.com with the manufacturing expertise of Rootstock gives manufacturers exactly the solution they need. The stability, flexibility, functionality and extensibility that manufacturers are looking for that can only be found with Salesforce Sales Cloud and Service Cloud + Rootstock Cloud ERP + many business applications on the Salesforce platform. Techaisle 2016 Top 10 SMB & MidMarket Business Issues, IT Challenges, IT Priorities.